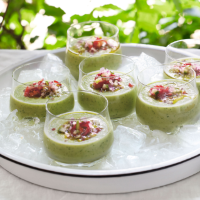 A refreshing summer soup with a subtle chilli kick. Preheat the oven to 200°C, gas mark 6. To make the tortilla chips, mix the olive oil with the paprika and brush over each side of the tortillas, season and place in a single layer on a baking sheet. Bake for 8-10 minutes until golden and crisp then set aside to cool. Break into large, rough pieces. Next make the soup. Cut a 3cm piece from the cucumber and set aside. Place the remaining cucumber, avocado, green chilli, salad onions, coriander, stock and yogurt in a food processor or liquidiser and pulse until smooth. Add the lime juice, Tabasco and seasoning to taste. Chill for at least 30 minutes or for up to 6 hours. Finely chop the reserved cucumber. Serve the soup in small glasses or bowls topped with the cucumber, red chilli, tomato, red onion and a drizzle of avocado oil, with the tortilla chips alongside. This recipe was first published in Wed May 20 15:30:22 BST 2015.